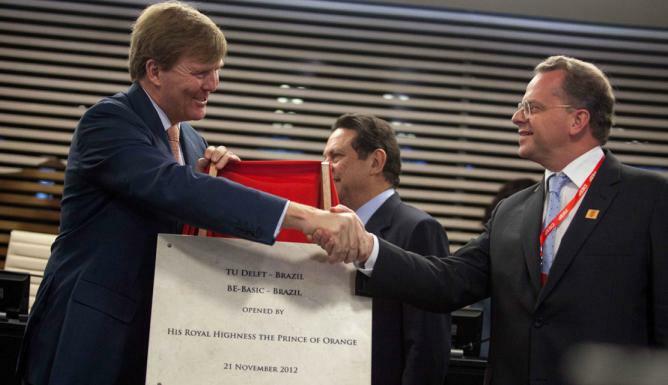 In 2012 Prince of Orange Willem-Alexander officially opened the TU Delft and BE-Basic Brazil office, located in Campinas (close to the state capital São Paulo), a region where much of the chemical industry and many of the key knowledge institutions are concentrated. The objective of the Brazil Office is to further intensify and facilitate the cooperation with Brazil, in the fields of research, education and business development. The office is located at the campus of the University of Campinas (UNICAMP), in the Interdisciplinary Centre for Energy Planning (NIPE). It is coordinated by Patricia Osseweijer and Luuk van der Wielen with a local staff providing support for daily operations, finances, contracts, communication, events etc. Besides this permanent staff, a number of researchers and professors from TU Delft and its partners regularly visit for lectures, project meetings or congresses. The office aims to develop joint (R&D, demonstration, dual degree PhD, PDEng) projects in state-of-the-art research environments, building human capital for the fast expanding biobased sector in The Netherlands and in Brazil, and to extend the bottom-up positive TU Delft / BE-Basic branding. The office aims to provide a hub for TU Delft and BE-Basic’s (industrial) partners, leading to successful piloting and field studies accelerating sustainable technology development and transfer and facilitating access for Brazilian partners to TU Delft and TU Delft’s global network, and viceversa.